Yoga harmonizes the mind with the body and this results in real quantum benefits. It is now an open secret that the will of the mind has enabled people to achieve extraordinary physical feats, which proves beyond doubt-the mind and body connection. As it is known to all “ Health is Wealth”, moreover a sound mind resides in a healthy body. To prove the upper sayings, we emphasize most on the sports and games activities. Because they are essential part of any educational institute as they produce team spirit and produces a feeling of sportsmanship in the individual. The Institute simply boasts about its playground which is of the Olympic like six international running tracks with standard cricket pitch, for sports activities. Besides Cricket Ground, Institute is having its own volley-ball court, football ground and other indoor sports such as Table Tennis, Chess, & Carom etc. Institute hires a very good sports teacher to guide future technocrats in the field of sports and games. Our students have created a niche for themselves in the field of cultural events by proving their excellence in the various competitions at national, state and university level. Nothing is developed personality is not developed. Personality is no doubt one’s personal identity. As the institute is providing future engineers so it is mandatory that they should act smart because “People notice how do we walk and how do we talk.” We at Bhagwant University take great care of personality since first semester so that by the end of semester along with their degree they develop themselves to be called a multidimensional personality. This is one of the well known club which teaches the real arts of life to give the flying color of success. The Club bears a large number of the members. “The Jack of all the trades and master of none.” Gone are the days, but when we talk about the fine arts club, they try to make it “Jack of all trades and master of all.” Needless to reveal, there are various artist produced by fine arts club. Cyber Club is one of the innovative club of the Institute and has performed many activities for the betterment of students. The Institute has designed this club for helping non-IT students to develop interest in recent development in field of computer science. Here, we perform many activities like, Paper Presentation, Picture View Presentation, Seminars on recent development and logical-Aptitude tests. In this club, we give the knowledge about different languages like C, C++, ASP.Net.HTML, XML, Java.. The National Service Scheme (NSS) was started to establish a meaningful linkage between the campus and the community. Therefore, student youth, teachers and the community are considered the three basic components of the National Service Scheme. The National Service Scheme was started to establish a meaningful linkage between the campus and the community. AIET has NSS unit comprising more than 300 NSS Volunteers involved in various activities like Blood Donation, Tree Plantation, Cleanliness Drive, AIDS Awareness programs and many more. Regular NSS Activity: Under this, Bhagwant University students undertake various programmes in the adopted villages, college/school campuses and urban slums during week ends or after college hours. 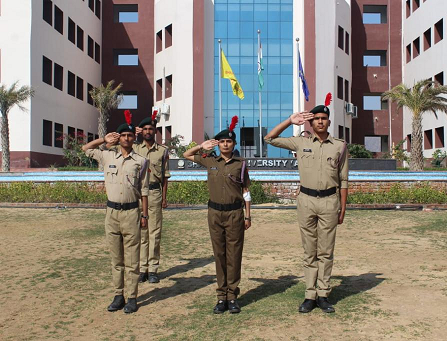 The primary objective of this University is to provide intellectual and physical development of the Student. The student in this University are groomed and trained to set the standard benchmark. Bhagwant University Ajmer expects its students to be strong, principled and committed citizens, so that they can face the challenges of the world. Our endeavor at Bhagwant University is that students should contribute to the needs and development of the society to conserve the environment and the heritage at all levels and leave their imprint. The Logic Club has been initiated with the aim of preparing students to qualify various types of Competitive Examinations. The different types of reasoning & mental ability test, induces students to think critically & analyze rationally. It even widens their horizons.